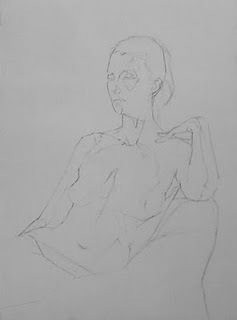 Today was the first of a 5-day pose I have arranged in my studio this week. We have 5 artists participating (including me) and we work each day from 10am-5pm. For artists this is the ultimate working-stay-cation! Today we spent the first hour or so setting up a pose we all liked from many angles (no small feat! ), and then chose our spots by lottery (I drew a #5, dead last, but I like my spot). The we all mounted our paper and got to work. I'm attempting to do a very fast (fast for me!) painting of the our model Danae this week, so today I blocked in this line drawing on mylar paper and then during a model break I transferred the drawing to my 16x20 hand-primed panel. I spent the last part of the day refining the pencil drawing directly on the panel. Then I erased the extra graphite, brushed down the surface with a wide, flat brush to get rid of eraser crumbs, and coated it with thinned Damar varnish (thinned with about 1/5th mineral spirits) to preserve the drawing and seal the porous surface. Tomorrow I start painting - record speed for me! I'll be giving a video tour of my studio, a behind-the-scenes look at my latest Wax Paper painting "The Wave", and also doing a drawing demo. You can even submit your own questions, in advance or in real time. Sadie, I'm so happy to see you doing more and more figurative pieces! This is sure to be a beauty. I only wish I lived much closer so I could join you. Do you always seal panels with Damar varnish so that they are not too porous, or do you only do this if you need to preserve a drawing underneath? Nathalie I always do a drawing, but I would also seal the surface if there was not a drawing, because the chalk-primed gesso makes a fairly "thirsty" surface. Some people use an oil primed panel because of this, I think it is less thirsty, but I do not do that. Erika thanks, hope you were able to join the webcast! If not, you can still download the recording. I don't work from photos, much less trace them. Painting for me is about the process, not the end result, so shortcuts are not very tempting. Plus a drawing that is simply a traced photo always looks a bit mechanical.